Beautiful piece of kit. High quality as you know. 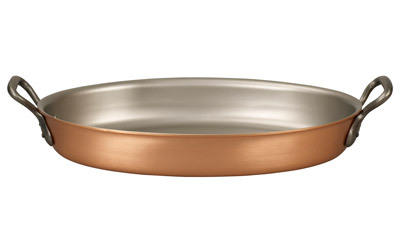 This is a huge pan, and can easily accommodate a very large chicken, or small turkey. 13 customers found this review helpful. Did you? Yes, I did! I've been roasting quite a bit with this pan. Nice results but pretty heavy when full of food. Combine that with hot handles and it's probably not suitable for some. 297 customers found this review helpful. Did you? Yes, I did! This one of my favourite piece.Cauliflower and broccoli cheese,Daufinoise potatoes yummy.Again from the oven straight to the table.A definite must. 411 customers found this review helpful. Did you? Yes, I did! I have only had this a short time but it is so good that I have become a bit addicted to using it. I have roasted duck, turkey, chicken with superb results and have then used this pan on the hob to create gravy from the meat flavours left in the pan. Because of the even heat, it allows you to pick up all the pan juices easily and create a wonderful stock/gravy. I believe that the even heat distribution really assists with achieving the best gravy stock ever. Superb product!!! thanks Faulk Culinair. Any prospective purchasers sitting on the fence here..buy with total customer confidence. You definitely get what you pay for. 561 customers found this review helpful. Did you? Yes, I did! 548 customers found this review helpful. Did you? Yes, I did! An extremely well made,and versatile pan;sturdy,reassuringly weighty, with good comfortable handles .I find the pan a joy to cook in, and thankfully, easy to clean. I am really enjoying using this pan. And thank you Neil for your patience, and such wonderful customer service! 14 customers found this review helpful. Did you? Yes, I did! Since receiving this fantastic pan, I have so.....enjoyed creating yummy food. lunch, serving a roast with all the trimmings, and I used my fabulous pan as a serving dish ( warmed first in my warming draw) I arranged the craved meat and Yorkshire puddings on it, to a very receptive gathering. My treasure item and i, are going to have a long and very interesting future. Excellent creation Falk. 360 customers found this review helpful. Did you? Yes, I did! Although this is described primarily as an au gratin pan,it is extremely versatile. It makes an excellent roasting pan, and the large oval conformation makes for a perfect fish frying pan! Great for baking/grilling whole trout for a family of four. Just fits the AGA roasting oven. 604 customers found this review helpful. Did you? Yes, I did!